Milton Keynes got off to a flying start in Four Counties Division 1 with a 127-run win over Westcroft on Saturday. After the opening round of fixtures were rained off, this weekend saw the first action of the new campaign, and MK hit the ground running. Opener Nick Hillman top scored for MK with 55, but with only four batsmen in double figures, it threatened to be a difficult afternoon, especially with Huzaifah Ahmed taking 6-24 to ensure the tail barely wagged. However, a brilliant spell of bowling from Joe Fairbrother (5-17) ensured Westcroft didn't even reach the century mark, skittled for just 91 to hand MK the win. 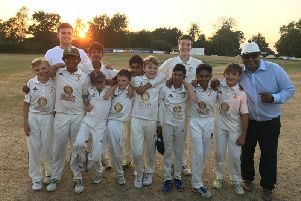 A 134-run partnership between Matt Goss and Matt Shiel guided North Crawley to a 147-run victory over New City, but it was the exploits of bowler Ollie Clarke who stole the show. Goss fired 76, and Shield 61 not out as the visitors posted 209-4. In reply, Clarke took a sensational 8-38 to reduce New City for 62 all out. Olney Town got off to a winning start too, beating New Bradwell by 96 runs. Openers Jack Watson (47) and Peter Young (37) put on 58 for the opening wicket as Olney reached 200-9. David Little was the pick of the bowlers for New Bradwell, taking 3-39. But while opener Chris Timms top scored for New Bradwell with 58, his partners dropped like flies as Stuart Keeping (4-11) and David Livermore (3-40) mopped them up for 105.